Plus, why it was a night to forget for Chelsea forward Alvaro Morata. Jack Wilshere celebrates scoring a goal. 1. Is Jack Wilshere back? ‘JACK IS BACK’ said Sky Sports commentator Martin Tyler as the midfielder put Arsenal in front against Chelsea at the Emirates tonight, but is he really? The midfielder took his goal extremely well and showed his usual array of neat passes throughout the match, but whether he is good enough for a team of Arsenal’s ambitions remains up for debate. 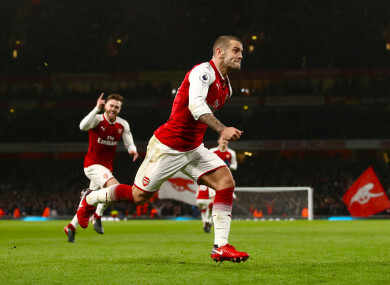 At 26, there is a sense that despite Wilshere’s obvious gifts, he has yet to fulfill his potential and he is one of a number of Gunners players who has been guilty of underperforming in recent years. The England international had some positive moments in this evening’s game, but he also looked off the pace on occasion, particularly in the first half, as he was outshone by the consistently inventive ex-Arsenal star Cesc Fabregas. In a game that is more athletic than ever, Wilshere looked slugglish when up against some of Chelsea’s more impressive physical specimens. Of course, creative players are sometimes expected to be deficient in other areas of the game, but they need to be fairly special to be accommodated in the cutthroat world of Premier League football. 43 - Jack Wilshere scored his first goal in his last 43 Premier League games, since netting v West Brom in May 2015. Timely. Wilshere has had a difficult time with injuries in recent years, so perhaps he could get better as the season progresses, but despite flashes of brilliance tonight, there remains a question mark over him as a player, and whether he is capable of consistently competing at the highest level. Eyebrows were inevitably raised when Chelsea paid Real Madrid a reported club-record fee of £60 million for Alvaro Morata in the summer, with Antonio Conte in desperate need of a replacement for the outgoing Diego Costa. Overall, he has had a decent start to his Chelsea career, with 12 goals in 27 appearances in all competitions, including the winner in their Premier League clash with Man United earlier this season. But tonight, to put it bluntly, the striker had a nightmare. It is no exaggeration to suggest he could have had a hat-trick, missing at least two gilt-edged chances. Morata is only 25 and is still adjusting to the Premier League, so he deserves to be cut some slack, yet this evening’s game exposed the Spanish international’s lack of ruthlessness in front of goal, and suggests he still has some way to go before he can be compared with the elite likes of Harry Kane and Sergio Aguero. This evening’s match highlighted why so many people across the world watch Premier League football, with countless thrills, controversial moments and an unrelenting pace in a game that you could seldom afford to take your eyes off. It is arguably at least the third match-of-the-season contender that Arsenal have been involved in — their 3-1 defeat to Man United and their 3-3 draw with Liverpool also made for thrilling TV viewing. While Man City running away with the title this season has taken a considerable degree of tension and excitement out of proceedings, it has not necessarily lessened English football’s entertainment value in general. Yet the error-ridden clash at the Emirates also exposed some of the league’s flaws, most notably poor defending and naive tactics. Arsenal, in particular, were guilty of these failings — they could have conceded far more had Morata brought his shooting boots onto the pitch. It was also telling that the Gunners conceded more or less directly after scoring, while they were ultimately fortunate to earn a point. Morata missed a last-gasp one-on-one having been allowed to stroll through on goal totally unmarked — again just after the hosts had scored — in addition to Davide Zappacosta hiting the crossbar on the rebound. Arsenal’s stark lack of concentration and defensive stability just after scoring their goals is a damning indictment of not just the players in question, but the manner in which they are coached and goes some way towards explaining why they are no longer the force they once were under Arsene Wenger, despite their impressive attacking play at times tonight. Email “Is Jack Wilshere back and more Arsenal-Chelsea talking points”. Feedback on “Is Jack Wilshere back and more Arsenal-Chelsea talking points”.